We had already created a killer series of portraits in Prague with Daisy & Luis and after having such a wonderful time, they called us a few days later and asked if our crew could join them during their Venice part of their European trip. Luckily for us we had a few free days and as such flew there to begin planning our sunrise session. 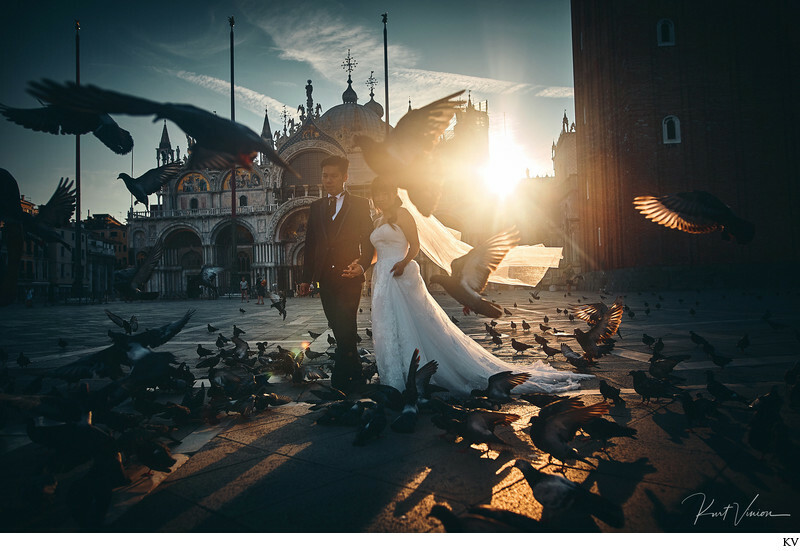 Having worked in Venice before we were very keen to capture this incredible city again. So with the assistance of a fabulous local hair & makeup artist, Lisa Semenzato, we started very our session very early, before the sun came up. To be honest we had such a good time capturing these two lovers simply enjoying this magical city that it was very hard selecting wonderful images as there were simply too many. The natural light, sun lit portraits are some of my favorites and of course those beautiful Gondola shots are as we..
What I really enjoy about working with Daisy & Luis; simply capturing them as they walked around taking it all in. Of course we also created those must have Hong Kong styled portraits, but having the additional more relaxed / natural styled portraits of these two enjoying their time and being natural is what makes this session that much more special.